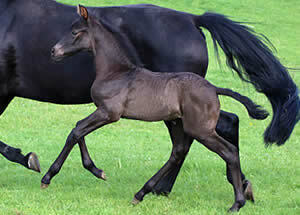 Finally an Ampere colt !! We kept his super star full sister Mystique last year and we have been dreaming of a colt and what a colt! With wonderful type, long legs and super paces we are thrilled with him. His dam Pr St Machita was bred by Oldenburg royalty Georg Sieverding. From Machita's mare line come the Champion stallions Fürstenball and Sieger Hit and many more. His sire Ampere was Champion of the KWPN stallion licensing, then Champion of the performance test and has bred Champion stallions - how impressive is that! We are very excited about this colt's future! In 2018 Machita was awarded Elite Status by the Oldenburg Verband on the basis of her exceptional offspring!